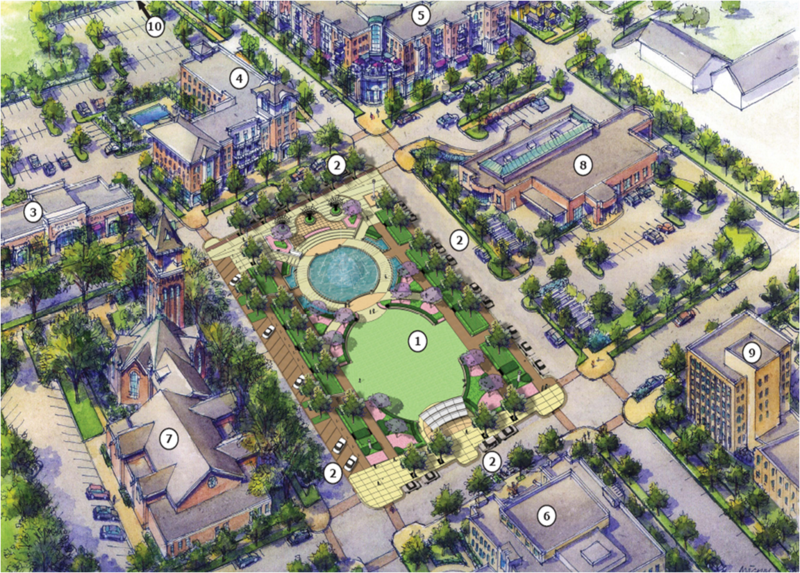 The development of the neighborhood surrounding Fountain Park area is the result of a public-private partnership between the City of Rock Hill and Comporium. Located adjacent to the intersections of Saluda Street, East Main Street, Elizabeth Lane, and East Black Street, it will feature Fountain Park, a new public park featuring a fountain with an interactive water jet display. 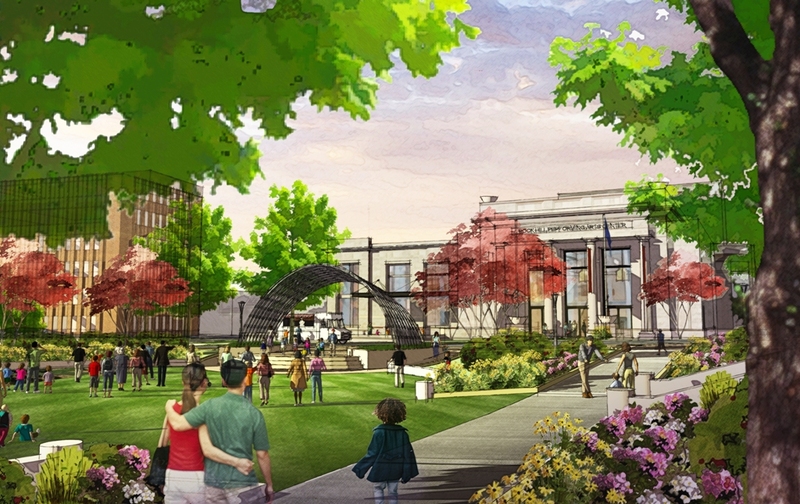 Since 2010, Comporium has worked closely with the City of Rock Hill to develop multiple phases of the project. Surrounding Fountain Park will be a mixed use development spearheaded by Comporium. The first building to be constructed is Fountain Park Place, a 48,000 sq. ft. office building located at Elizabeth Lane and East Main Street. Future phases of development include a 100-room hotel on East Main Street facing the park; retail, office, and residential spaces; and a performing arts center. Replacing what had been dubbed as the ugliest parking lot in Rock Hill, Fountain Park will feature an animated, interactive fountain at the end adjacent to Main St. The park will also include a central green space and a small outdoor performance venue suitable for small public events at the end along Black St. When completed in the early summer of 2014, the project will also see the improvement of adjacent roads and parking. 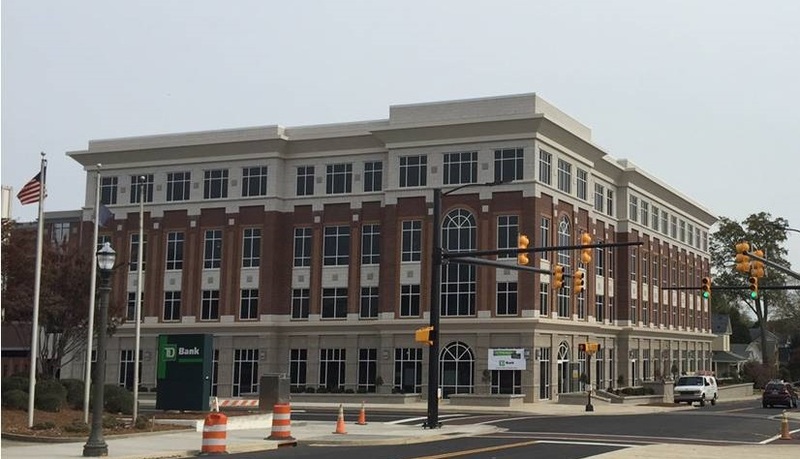 Comporium’s new 48,000-square-foot professional office building, Fountain Park Place is the first major construction project in downtown Rock Hill in decades. The building, being developed by the Warren Norman Company and constructed by Leitner Construction, is forecast to provide 150 jobs when it is fully occupied. Additionally, the City is building a parking deck attached to Fountain Park Place with 194 spaces to serve the businesses, employees, and customers of the Old Town East area. Both are expected to be completed in the early summer of 2014. A feasibility study is currently underway to determine if downtown can sustain a 90-100 room hotel. A feasibility study was recently completed that confirms that Rock Hill could support a 500 seat performance and multi-purpose center. While the timeline, design, and location for such a center are still in the works, it is very likely that Rock Hill will have a new performing arts center in the foreseeable future. Comporium is a privately-held, diversified technology and communications company that focuses on exceeding its customers’ expectations with technologically advanced services that make customers’ lives easier. It is invested in companies that focus on data, switching, transport, storage, and intellectual property that recognizes the emerging importance of a connected world. For more information, please visit www.comporium.com. 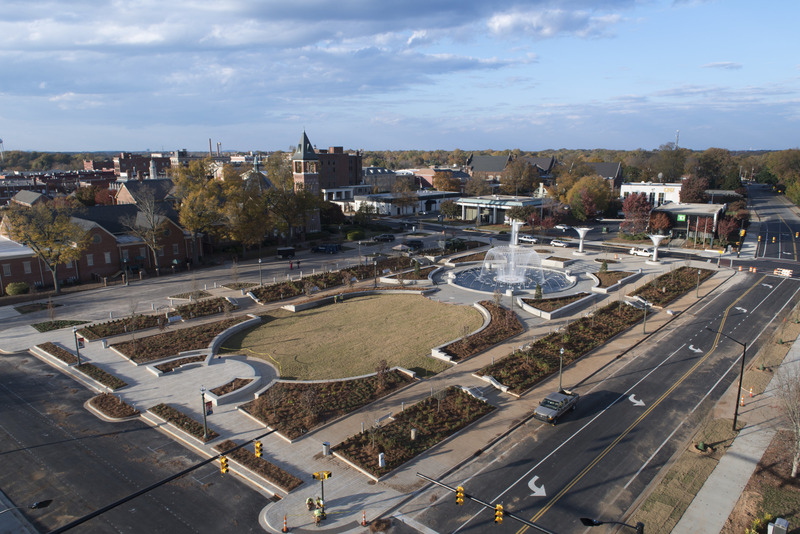 Rock Hill, South Carolina is a business-savvy blend of historic charm and responsibly implemented expansion. The city is located in the north-central area of South Carolina approximately 20 miles south of Charlotte, NC along the I-77 corridor. Rock Hill is a growing community of 67,000 residents, and the City encompasses over 36 square miles. Rock Hill is the largest city in York County, SC and the only major South Carolina city in the Charlotte area.